Super important! Vaccines are like antibiotics, you should choose your treatment. What makes life so great is that each person has a gift. Each person has experience and a knowledge base that guides our path. Therefore it is really important that each person is allowed to express a personal choice and then experience the consequences of that choice. No matter where you stand on vaccines, there is a risk either way. But you have to make that decision. Currently in the making is a bill that would mandate adult vaccines. Medical choices should never be mandated. It’s each persons’ right to choose how to manage life. Now you have until March 23, 2015 to send an email and voice your right to choose. This is wonderful that our voices can be heard and solicited. The Health and Human Services Dept. 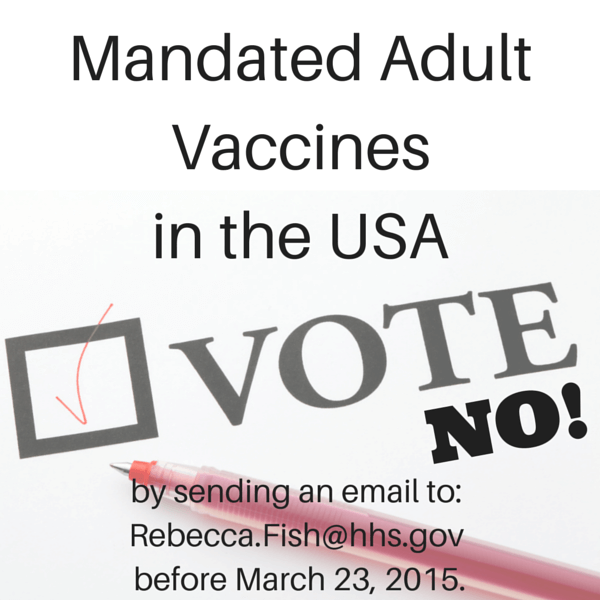 (HHS) has a plan to “Mandate Adult Vaccinations” in an otherwise free nation. Therefore, I appeal for you to send an email to: Rebecca.Fish@hhs.gov before March 23. Attached is my copy that I expressly give you permission to take, copy, make it yours, and send! This is my appeal to keep our freedoms in this nation without allowing the wave-like fears to lead us into dangerous waters of mandating a trend into law. I appeal to NOT mandate adult vaccinations. I am a mom and I have fostered 7 children. I most emphatically oppose any implementation of a vaccine policy on adults or children for that matter. Our allowance for Vaccine exemptions MUST stay intact. It is the right of a free nation and a mother in a free nation to determine what goes into my children and what goes into me. There are ingredients used in today’s vaccines that are not acceptable to me. If I work hard to guard the food we consume, it would be foolish to then simply inject those toxins that we seek to avoid. Also, vaccinations should not be a condition of employment, even for the medical and health professionals. It should not be mandated in order to foster or adopt children as some states are currently mandating without the proper jurisdiction. The vaccines are live strains of the very same disease and in these cases (choosing to receive the live vaccines), one should stay home to prevent spreading this to the very young, immune-weak, and elderly. When our foster son had cancer and went for stem cell harvesting, we were told NOT to vaccinate the live strains with our other children. That this would harm our chemo-cancer-weakened son. We have paid out of our own pockets to have titers pulled for our children and foster-to-adopt children. Many of the vaccines did not succeed in making our foster children immune. Boosting their immune system seems to have been more successful. Additionally, Italy recently studied and then ruled that vaccines do cause autism. There are many other studies that show harm from vaccines. To date, there are around 99 published studies that link vaccinations with autism. My first son had major complications after receiving the MMR. And I believe there are instances where it is harmful when not taking vaccines for certain people. Therefore, based on the research to date, it does not seem that some vaccines are “as effective” as labeled and that the ingredients really should be cleaned up. Subsequently, both options provide a risk and should not be mandated. My studies show that there was 1 horrible death from the measles in the US in 2003. There have been no deaths from measles in the last 10 years. Yet, in this same 10 years there are 108 recorded deaths after a measles vaccine. Please stop the excessive lobbying from pharmaceutical companies in order to obtain monopolies on their vaccine products. It should always be the choice of an individual as to how disease is treated. Thank you for allowing me to express my opinion and may we come together as Moms, Dads, Daughters, and Sons and continue to allow the human-privilege to choose the way we prevent disease because we will each be held accountable for our lives and the welfare of our families. thanks so much for emailing this out, Mandy. we are a little covered up with things at the moment and would have missed the opportunity to just say NO! we have also sent it out to dozens of our closest friends who might have missed the chance too. God bless your day! Great, Terri. Glad you could take a moment to help promote our right to have a choice! Thanks for sending it out, we only have a few more days to express our opinion. Bless your day also.